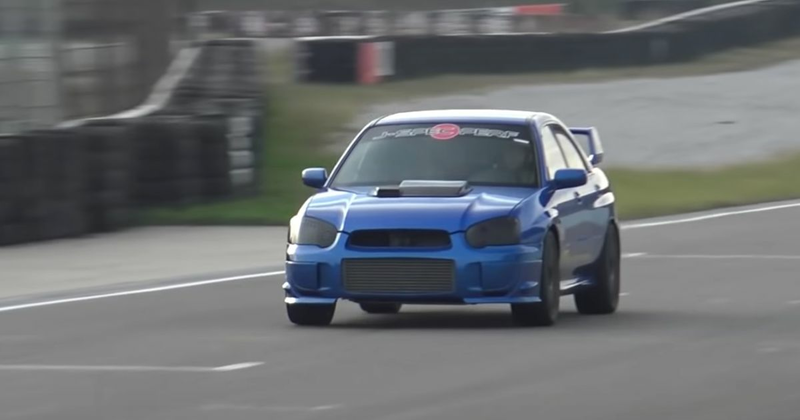 Although it’s reasonably restrained from the outside, this 2003 Subaru Impreza WRX STI is packing some very serious modifications. Built by AB Performance, its engined has been stroked to 2.1-litres and is now force-fed by a Precision turbocharger. The total power output is 800bhp, and thanks to a titanium exhaust, the soundtrack is pretty mega too. Perhaps our favourite modification, though, is the six-speed sequential gearbox, which makes for some ferocious shifts. Recommended car throttle shop Worldwide Shipping In The CT Shop Car Throttle Submit Your Videos To Get Featured On Our Social Channels Tuning Ken Block's 'Hoonitruck' Has A 900bhp Ford GT Race Car Engine Tuning This Angry Four-Rotor RX-7 Dyno Run Has A Racing Car Soundtrack Tuning This 10.6-Litre, Twin-V8 Acura RSX Is A Jaw-Dropping 1700hp Project Tuning Hennessey Will Crank Your McLaren 600LT Up To 1001bhp Tuning This 700bhp Subaru WRX Has A 9000rpm Skyline GT-R Drivetrain Tuning German Tuner Pumps Aston Martin Vantage Up To 671bhp Tuning E36 BMW 325i Time Attack Car Runs M4 Dual Clutch Gearbox Tuning Are We All Using The Term ‘Shock Absorbers’ Wrong?